MAX RELAX - Get quick relief from stress, anxiety and depressive states. Lift up your mood quickly. If stress is getting you down you can now do something about it. Let MAX RELAX restore the cheer and care free mood that may be missing in your life. MAX RELAX will replenish your body, energize your mood, making it more bright and lively. You will feel it working immediately. Unlike prescription antidepressant drugs, MAX RELAX is all natural, completely safe and non-addictive. Thus, you will get fast relief without the worries you may encounter with prescription medications and their unwanted side effects. Chronic stress, as evidenced by higher and more prolonged levels of cortisol in the bloodstream, has been shown to have a host of negative effects like impaired cognitive performance, blood sugar imbalances, lowered immune response, suppressed thyroid function and high blood pressure. Cortisol has been called the 'death hormone' by bestselling author and skin doctor Nicholas Perricone, MD (The Wrinkle Cure). Study after study has shown that chronic stress also speeds up the aging process and increases the risk for more severe degenerative diseases like cancer, heart attacks and diabetes. Fortunately, science has also shown that certain naturally occurring ingredients can help maintain optimal brain function. The active ingredients in MAX RELAX can work to help regulate the chemicals that influence your moods, without the debilitating side effects of prescription drugs! MAX RELAX works quickly. It helps optimize brain function by stabilizing electrical impulses between neurons. 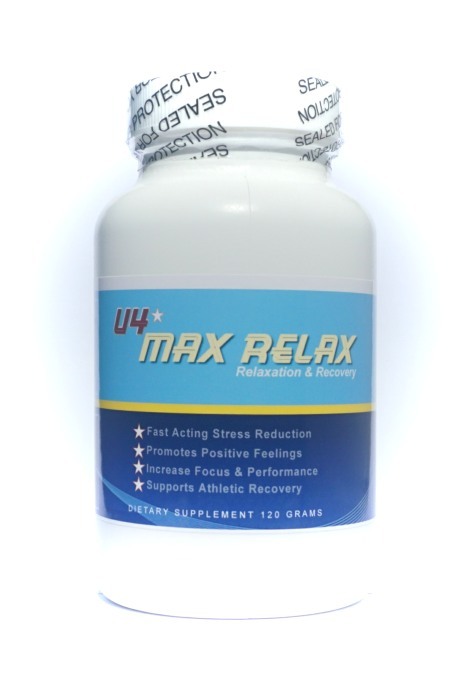 As a result MAX RELAX excels in promoting relaxation, relieving stress and anxiety and improving mental clarity. Take it and feel it lift away your tension while uplifting your mood. You can feel it work immediately! For most people the relaxing effects can be felt in as little as 10-20 minutes. Sustained levels of stress and anxiety not only decrease immune function but they also increase fat and decrease muscle tone. By busting stress and energizing your mood MAX RELAX also helps get rid of the hormones making you fat! Plus it increases energy and motivation making it a great product to take prior to exercise. Take 3/4 of a teaspoon with water or your favorite beverage. If needed add 1/2 tsp. until desired effect is achieved. Best taken between meals or on a light stomach. Best used on a cyclic or periodic basis. SUPPLEMENT FACTS Serving Size: 1 teaspoon (4 grams) Servings Per Container: 30 appox.